MPOW is in the news again, this time for a collaborative effort with my former POW. Rochester resident Kim Sin closes his eyes and daydreams. He remembers seeing the children in his native Cambodia, sifting through trash looking for a meal. But he envisions a place where those children can make a decent living and learn English, doing so with books donated by people in southeastern Minnesota. The dream isn’t too far from the mark. Sin, 33, and several friends have created a school in Phnom Penh, Cambodia, that teaches English to about 200 people, from young children to 20-year-olds. He sends $800 a month to the school, as do others. The school has been in operation for about four years and recently received a donation for furniture and bookcases from University of Minnesota-Rochester staff. But when Sin, who works in the UMR information technology department, showed his co-workers pictures of the school, they saw that more work needs to be done. “When he showed us a picture of the library, the bookshelf was empty,” UMR librarian Mary Beth Sancomb-Moran said. So Sancomb-Moran used her contacts throughSoutheastern Libraries Cooperating, a group that fosters collaboration with more than 130 libraries, to find books the school could use. The group came up with more than 1,000 books to send to the school, Cambodian Family Organization. “It shows that we don’t have to give money to make a difference,” Sin said. He got involved in creating the school while visiting Cambodia with Rochester Community and Technical College students. Sin still takes Rochester students to the country his family fled in because of war and some students have returned to the school and taught for several months at a time. Sin, who came to Rochester in July 1983, when he was 6, said his vision is to have American students be ambassadors to the Cambodian students. But while the books will eventually serve the roughly 200 students at the school, the story isn’t complete. Sin has to find a way to transport the books to Cambodia. He’s looking for a partner to help pay the estimated $2,000 shipping cost. He’s optimistic the books will reach their intended destination. “I think the best thing to help these kids is to give them an education,” Sin said. I love that we were able to help. I love that a group of libraries got together and donated enough books to fill the library for the students in Cambodia. I love that those Cambodian students will now have an opportunity to improve their lives, with help from a group of librarians in Minnesota. To all that donated, thank you. Michael Porter, speaking at lunch. Fascinating to see how our integration with technology has changed. Can be an interesting overlap between using social networking tools personally and professionally. May be more challenging for us because we work with the public so much. Products and sites mentioned are on Delicious/libraryman. Tag: identity. Also need to consider personal safety. Personal Flickr account has over 250,000 views. Amazing amount of traffic. Interesting line between being online as much as you are and narcissism, whether representing yourself or the institution. Your mother will love you regardless! Online Reputation management – watch it! Search for yourself or your library, see what people are saying about you. WebJunction – has functions for creating a profile, adding friends, joining groups. If you’re writing a blog, put the blog post on your Facebook page, Tweet about it on Twitter. Interesting user data available on Facebook fans. Increase your linkability. Put easy links out for people to follow. Reuse content in multiple venues. Make tagging and bookmarking easy. Options for interaction are key: comments, popular social tools. “Tweet this” button, etc. Encourage the mashup. Let others use your work/ideas (within reason.) Creative commons. Do…name other people, add hashtags, etc. Be aware of how you’re presenting yourself online. Pictures of you drinking, not fully clothed, etc. may not be something you want to share. Why teach copyright? Few people do; there’s a niche on campus. Confusion reigns on campuses about copyright. Myths reign. e.g. “Digital content has no physical presence and therefore has no copyright laws.” The law reigns. Name calling – you’re a pirate! Two angles on teaching copyright: fallacy is that there’s one one right answer or only one right way to teach it. Fair use – “real life is often messy.” To teach something well, you have to talk about the whole truth. A holier-than-thou attitude will turn off your audience. Ways to deliver copyright education – we’re good. We play around with ways to do this. Web sites, short films and tutorials, lectures, bookmarks, posters, e-mailings, skits, radio spots. Will be writing a textbook about copyright – will be creative commons. No such textbook exists currently. What works for you? What is your goal? Who is your audience? Small things like table tents have the advantage of repitition. Web sites are wonderful, but if you build it, will they come? Scenarios are helpful. Don’t make them too complicated. Showing the short film, “A Fairy Use Tale.” Cute. Rights of the copyright owner: reproduce, derivatives, distribute copies, perform, display. Asking audience to come up with an acronym. No one comes up with one. She suggests PRoDDD. Someone comes up with 3DPR – nod to Star Wars. Social networking tools encountered much more resistance four years ago. Plays online in a number of different venues – Second Life, World of Warcraft. First time he had lefse was in doing training for the Bill and Melinda Gates Foundation. Adoption, integration, and effective use of technology is our biggest challenge. Wherever you go in the world, there are libraries in some form. There’s something substantive behind this. We need to become more relevant with the use of technology, not less relevant. October, 2006. 64 GB USB 2.9 Flash Drive – $5459.99. Within two years, an amazing price change. Think about the implications for five or ten years from now with this sort of computer hardware. Science fiction vs. science fact. Star Trek used LCARS – Library Computer Access and Retrieval System. Also used a PADD – looks very much like an iPhone. Content provision and access – what, when and how it is desired. ROKU – connects to TV and to home network. Can stream video on demand. Has changed the way he views television. Companies are providing services that are well ahead of libraries. Slingbox – connects to entertainment system at home – can watch and control from anywhere you have broadband. Internet speed is the primary hiccup. Screen technology is changing, as well. Think about how the size of televisions had changed. The infrastructure that we have now in libraries is not what we need in order to succeed. Cell phones 10 years ago were just phones. Now, they’re mini-computers. Converged ubiquitous computing. Computer and cell phone – in a pen. Comment from a fellow librarian – Totally James Bond. Content access is what libraries are about. Where are libraries in this? The companies that are dealing with content access and making innovations, we need to think about them and how they’re doing things. We don’t have people working on our infrastructure to make the changes we need like business do – it’s not part of what libraries do. This is the lynchpin that is missing from what libraries do right now. We need to understand this stuff. Ubiquitous computing – embedded, personalized, context aware, adaptive, anticipatory. What does this mean for libraries? Espresso Book Machine – books made to order, at point of sale, in 4 minutes. 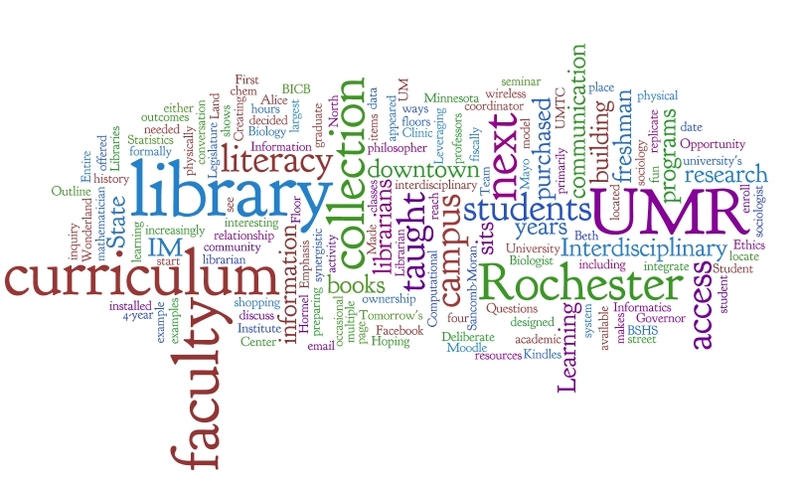 What do you think your libraries will be like in 50 years? Format or genre will become increasingly irrelevant. It’s all about content. as soon as iTunes realizes that electronic journals will make them money and is worth their time to pursue, they will start offering electronic journals for a lower price. What are the implications for libraries? Where are libraries now? We need to do something. We need something substantial and real to help this get done. Success is up to us. Libraries may not be able to survive and thrive if significant adjustments are not made soon. Give me what I want, when I want it, in the format that I want. If your library has an identity tied to content in the form of books, the majority of the content will not be in books in the next 20 years. Electronic content must become the major content format people associate with libraries. Libraries must circulate electronic content better than anyone else. We need a digital strategy for electronics content access. Lots of people have library cards, but libraries do a terrible job of electronic distribution. It’s a very complicated issue, and it’s expensive to deal with. We need to work together and we can change things. I’m delighted to report that my friend and grad school classmate, Judy Van Acker, is one of Library Journal’s 2010 Movers and Shakers! As mentioned in this post, the people of Hull, Massachusetts have cut their library’s budget to the point that they lost their state certification. In response, a neighboring library’s Board voted to stop lending materials to Hull residents. Hull residents have used the Hingham library rather heavily in the past; one-third of the materials lent to non-residents were lent to Hull patrons. An 11-year old in Hull is so upset about the loss of her library privileges that she has organized an all-day readathon to raise funds. Calliope is also an avid user of libraries, borrowing books from across the region and frequenting branches throughout the South Shore on her way to and from school, ballet, and karate practice. So it came as a particular blow when cuts in Hull not only sheared the library’s budget and hours but also cost the town its state certification last month. “Now people from Hull can’t go to any other library,” said Calliope, whose library card is no longer welcome in most other communities. The 11-year-old decided to do something about it. Today she organized an all-day “readathon” of the J.K. Rowling book that started it all, “Harry Potter and the Sorcerer’s Stone,” to raise awareness about the situation and money for the nonprofit group that supports the library. I hope this shames the board of the Hull library, the Hull city council, and anyone else that’s listening in Hull to wake up and refund the library. I had an interesting phone call this afternoon. A gentleman asked whether we carried a particular journal. I checked and we do – in an online format. He scoffed, “Oh, no. I don’t do that internet stuff.” He thanked me and hung up. I have been pondering this ever since our conversation. This “internet stuff” is becoming more and more prevalent, especially for academic journals. I wonder what he will do, when the only access he will have will be online? And how many of this guy are there out there?